Most puzzle games are about careful, logical solutions. Uurnog Uurnlimited is not. There's nothing careful about it. Most of its puzzles can be solved in dozens of haphazard ways, and rendered completely impossible in twice as many. Starting over is a mainstay, but it never annoys because, while Uurnog is undeniably chaotic, it's built on systems so flexible and clever that you're always eager to try again. At least your goal is simple: collect animals and bring them back to your base, the save room. Birds and bugs and barky things that might be dogs are scattered around Uurnog's wild 2D world, which is connected by portal-like doors. To open doors and find new animals, you've got to collect keys. And to do that, you've got to get creative with blocks. Uurnog's vibrant art isn't voxel-based, but its world is very much built on blocks. Everything is a block, and every block can be used. Enemies are blocks, bombs are blocks, birds are blocks, guns are blocks. You can stand on blocks to pick them up and then use or throw them, or put up to four of them in your inventory for future use. You can kick off blocks while you're holding them to jerry-rig a double-jump. You can put a block inside another block, then put that block inside another block. There's very little you can't do with blocks, provided you've got the right ones. Which brings us to the save room, Uurnog's support beam. The save room serves as both your hub and your closet. It's where you access areas, and more importantly it's where you stash blocks you might need later—stuff like extra weapons and animals, money, bombs, healing items and all manner of boxes. It's also the only area in Uurnog that doesn't reset when you die. No matter what happens, you'll always find it exactly as you left it, for better or worse. Usually worse. One time I wanted to get a blue cat back to the save room to fill out my collection. The easiest way was to chuck it in one of the hoppers dotted around levels. Hoppers can store up to nine blocks, then when you return to the save room your blocks will arrive in the order you hoppered them. So I put the cat in the hopper and climbed in myself. But just before I teleported, I noticed that there were actually three blocks in the hopper, and my heart sank. One of them was the cat I wanted, but the other two were explosive bugs which, I knew from experience, were about to destroy some of the many valuable blocks I had stashed away in my save room. Anything that walks over or falls in the hopper is automatically sent to your save room. You can empty your save room by bringing stuff through doors, but that doesn't help when you accidentally mail yourself some enemies or bombs. Because when you do, you come home to a disastrous chain reaction that usually ends in your death or the loss of some really, really nice blocks. And again, the save room doesn't reset, so if you die mid-disaster, it'll still be going when you respawn. It's kind of a nightmare, but everything is replaceable so losing stuff doesn't sting. More than anything, it illustrates the possibilities of the save room. Curating and arranging your save room is pivotal to everything in Uurnog. 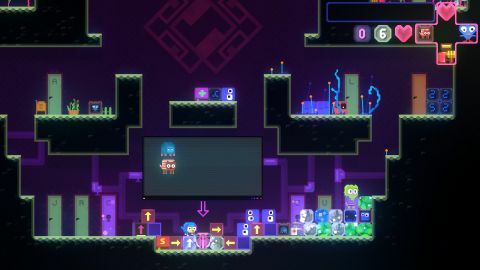 Because puzzles rarely have one clear solution and you can store blocks, you're free to analyze puzzles from the perspective of what you have in your save room. Puzzles are exceedingly organic and invite you to leverage the same chain reactions that frequently result in your save room's combustion. Executing your solution is infinitely more satisfying than figuring out the solution, and it's here that Uurnog truly shines. Every door you open introduces new blocks and options, and the solutions those new blocks unlock are increasingly mind-boggling. For example, there's a gun that lets you 'use' items from a distance. In other words, it triggers the effect of anything you shoot. It sounds like a small thing, but this gun completely changes the way you can manipulate the environment. There's also a block that acts as a portable reverse hopper, a block that teleports you to it, and a gun that puts anything you shoot into your hopper. These are all huge additions, and you're always considering them because you always have access to them. By designing solutions with the save room in mind, Uurnog achieves so much more than the usual insert-puzzle-here malarky. Buttons, lasers and time clones can't compete with a customizable toolkit and near-limitless interdimensional storage. It's totally hands-off but it successfully teaches you to think differently, which is the mark of any good puzzle game.